What does a teacher need the most? Probably sleep, but that’s a hard thing to shop for! How about coffee and chocolate? A cozy sweater or throw? A pretty scarf or tote? All this and more on my list! Looking for more holiday ideas? 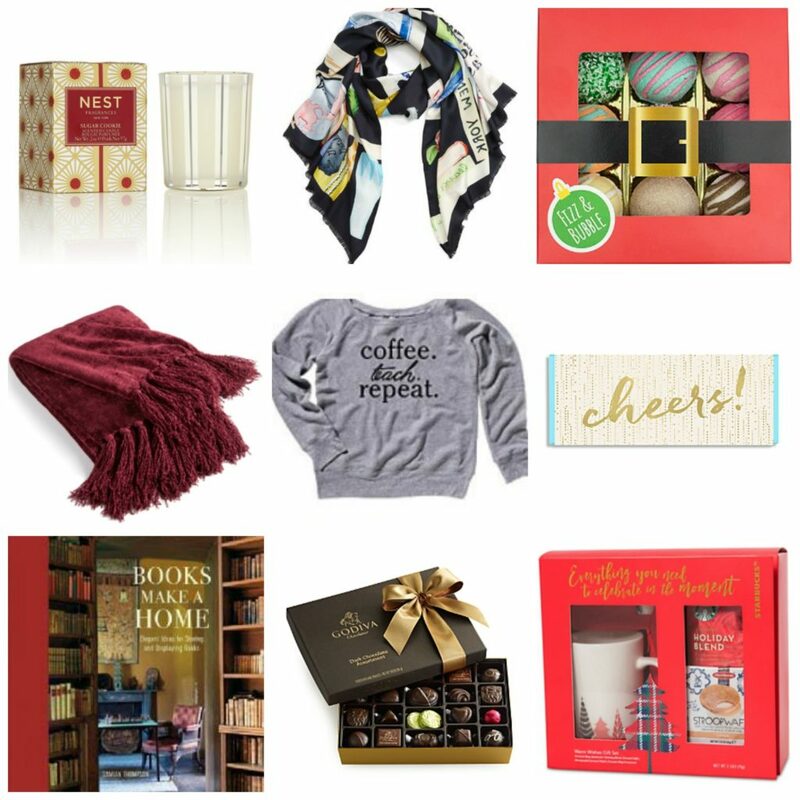 Here’s a list of gifts any hostess with the mostest would love to have. And do you have your holiday party outfit planned? Here’s a list of fabulous flattering holiday dresses for women over 40! And don’t miss out on my Tips and Tricks for Black Friday and Cyber Monday, coming later today! You know you’re chomping at the bit to get to those sales. Make sure your strategy is on point! The last gift I gave was to a wonderful junior high English teacher. She knew her students, not just their names, and had a knack of inspiring them to do their best work. My son noticed that she had a shoe rack under her desk. Aha! A shoe lover! I bought her a nice book bag with a typewriter keyboard printed on the side. She used it for shoes, of course, and commented every time I saw her about how much she liked it. My son saw her using it every day. It’s not easy to find a gift that “clicks”, but I’m happy it happened with a special teacher. By high school, with its large classes of 40 students, my son became a face in the crowd. I stopped giving gifts to teachers. Thank you to teachers who are committed to their students and profession. Thank you to teachers who take the time to connect with their students. The impression you make can last a lifetime. Thanks so much for the nice comment! Yeah, with big class sizes it gets harder to make that connection for sure. I have 35 students times 5 classes … it’s a lot! Fellow teacher here. I really appreciate Target and Amazon gift cards. I can buy myself a little something or, most likely, spend it for classroom supplies. I truly appreciate any gifts, but something to use in the classroom seems most valued.